The Fire Safety (Employees’ Capabilities) (England) Regulations 2010 were introduced to underline an employer’s responsibilities under the Regulatory Reform (Fire Safety) Order 2005. As part of this legislation, employers must carry out a fire safety risk assessment and keep it up to date. This shares the same approach as health and safety risk assessments and can be carried out either as part of an overall risk assessment or as a separate exercise. To help prevent fire in the workplace, your risk assessment should identify what could cause a fire to start and the people who may be at risk. The risks have been identified, appropriate action can be taken to control them. Consider whether you can avoid them altogether or, if this is not possible, how you can reduce the risks and manage them. Also consider how you will protect people if there is a fire. Ensure good housekeeping at all times, e.g. avoid build-up of rubbish that could burn. Consider how to detect fires and how to warn people quickly if they start, e.g. installing smoke alarms and fire alarms or bells. Install emergency lighting in dark escape routes. The Hot Topic Of Fire Prevention. The risk of fire is always a major worry for workplaces due to risks of their premises being damaged or even destroyed, and events such as Bonfire Night and unforeseen events such as the 2011 riots keep the Fire Brigade on its toes. Workplace fire regulations can be confusing, and since the Regulatory Reform (Fire Safety) Order 2005 came into force, the onus is on the employer to ensure that the correct fire safety plans are put into place. Fire and Rescue Authorities are the principal enforcers and have a statutory duty to enforce the requirements of the legislation. There are several areas that can be missed during a risk assessment which can leave companies vulnerable. In many cases damage could be caused by problems in neighbouring premises, something many organisations fail to consider in their risk assessments. Even though there are recommended quantities and types of equipment to be used, it is not always suitable for every business. Usually one water based extinguisher is required for each 200m² of floor space, with a minimum of one extinguisher per floor. However, in large or more complex premises, and depending on individual risks such as large amounts of electrical equipment or hazardous chemicals, a greater number or wider range of extinguishers could be necessary and some premises such as kitchens, may also require hose reels and fire blankets. 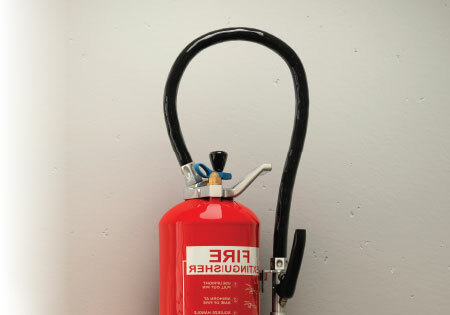 According to the UK’s fire safety industry, 80% of workplace fires are put out using portable fire extinguishers. However, it may be worth considering going above and beyond providing basic water based extinguishers, because they can leave lasting water damage once a fire has been extinguished and they are only really suitable for fires involving paper and wood. Carbon dioxide extinguishers are worthwhile in areas with a large amount of electrical items or flammable liquids, and for flammable gases only, powder extinguishers can be used. The British Standard Code of Practice BS 5306-3:2009 recommends that all fire extinguishers are serviced at least once a year by competent persons, i.e. a qualified technician or an employee who has undergone training, and every five years they need to be recharged and refilled or alternatively replaced. CO2 extinguishers cannot be recharged and therefore have to be replaced every 5 years.This has led to many organisations not only providing cycle storage facilities, but also investing in changing rooms, shower areas and lockers so anyone arriving at work on two wheels can still properly prepare for the day ahead. Today photoluminescent technology is used throughout the world to save lives and whether you’re on an aeroplane, standing at the top of a New York skyscraper or sitting on a train, the chances are the technology will be there to guide you to safety should anything go wrong. Jim Creak, Managing Director of Jalite, explains: "Photoluminescent technology has an endless number of uses but it wasn’t until the 1980s that it was first used as a safety product. This followed several disasters including the Piper Alpha oil platform explosion, Bradford City’s football stadium fire and the major fire at London’s King’s Cross which meant that before long safety way guidance systems were added to ships, oil exploration platforms, trains and aircraft to aid evacuation in emergency situations." NEWS - The Cost Of False Alarms. According to The Evening Standard, The London Fire Brigade is to start charging office blocks, hospitals and even Parliament for repeatedly calling 999 for false alarms. Brigade chiefs are fed up with their crews wasting valuable time in which they could be attending emergencies elsewhere. They will charge repeat offenders £290 per false alarm to recover costs as the fire service tightens its belt to meet budget cuts. Fire chiefs estimate they could save millions of pounds a year if they cover costs when they are called out to 10 false alarms or more in a year. They are also concerned that false alarms cause complacency with people failing to take them seriously after repeat non-incidents. Hospitals were the worst offenders with 2,683 call-outs last year.